What’s your Walkability? New features include this and more. Have you heard the term walkability? It’s exactly what it sounds like; in this case, the ability to walk from your home to desirable destinations. We’d like to introduce you to this and other new tools. 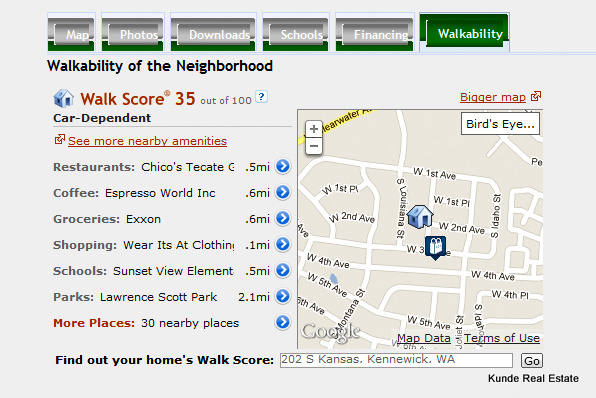 You can even check the walkablility score of your current home. “Map” is the fist tab. Click “map” in the upper right corner to choose streetmap or satellite view. You can also check the boxes to show locations of schools, grocery stores, restaurants, banks, gas stations, golf, and hospitals. “Photos” is the 2nd tab. It will show you a picture gallery of the home. The “Downloads” tab will link to printable information, such as the flyer. 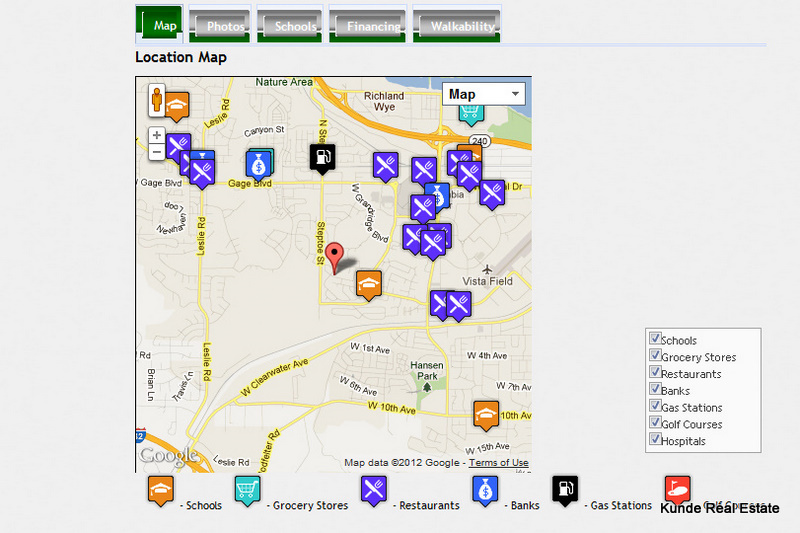 The “Schools” tab shows the name, address, phone, and stats of schools within a 3 mile radius. The “Financing” tab contains calculators to help you estimate monthly mortgage payments and closing costs. “Walkability” is the final tab. It rates the house between 1 and 100 based on walking distance to restaurants, coffee shops, grocery stores, shopping, schools, parks, and other destinations. At the bottom you can enter your own address. Our Richland home scored only 9 out of 100, putting us in the car-dependent category, but that’s okay–we have plenty of trails to walk (and run) on! Everyone has different preferences for location, schools, and proximity to business. Let us know what yours are.